Karl Popper’s methodological system of Falsifiability, which is to demarcate between empirical statements or systems of statements from non-empirical statements or systems of statements, relies on empirical statements being “public” or “inter-subjectively criticizable”. How would a Solipsist fit into methodological falsification, as an individual trying to take part in empirical statements? One simple answer would be that Solipsist can’t take part in science or produce empirical statements. The solipsist cannot take part in science because their is no discussion to be had. Discussions involve more than one individual, and the Solipsist would be the only individual. One sock short of warm toes. A solipsist, however, could produce in a weaker version of what Popper presents. To do this the Solipsist weaker version of methodological falsification would have many things in common, but at least one difference. The one difference is about the empirical statements for a Solipsist aren’t necessarily “public” or “inter-subjectively testable”. Empirical statements would have to be contingent statements. A contingent statement is possible true and possibly false. It is possibly true the Ravens won the Superbowl and it is possibly false the Ravens won the Superbowl. So “the Ravens won the Superbowl” is a contingent statement. Popper’s point about “public” appears to have one thing in common with a solipsist. Popper points out that “We do not take even our own observations quite seriously, or accept them as scientific observations, until we have repeated and tested them.” So a Solipsist would appear to meet this level that is mentioned. So a Solipsist could make statements that are public, and check to see if the statements end up being shown false by future observations. But the only individual to check for observations that show it is false is the Solipsist. In principle, only the Solipsist could show their own statements are false. The Solipsist may produce a hypothetical system, and check the internal consistency of that system. The Solipsist makes sure that no contradictions may be derived from it, and may also check to see what statements may be derived that can be tested against observations. It finds that no contradictions are derived and may move on to check the system against some observations. In the processes of looking for some observations, it is guided by the system being of a reproducible nature, and forbidden certain events from happening. So the Solipsist could hold to a statement that says “All x are y”, and goes looking for a single “x and ~y”. Such an observation would show the hypothesis is false. For all practical purposes, the Solipsist would be going through the same mechanism without being “public” in the full sense of what Popper mentions. Max Tegmark, a theoretical physicist that teaches at the Massachusetts Institute of Technology, has proposed that hypothesis that “all logically acceptable worlds exist“. Not only has Max Tegmark proposed this hypothesis itself, he believes that it is an empirical hypothesis or scientific hypothesis. Before I go into some of the ideas proposed by Tegmark, I will first go into a rough sketch of a form of logic known as Modal logic. More specifically, this form of modal logic is known as the S-5 system of modal logic and was formally created by Clarence Irving Lewis, C.I. Lewis. This system of logic plays off of the ideas of possible and necessary discussed about by Gottfried Wihelm von Leibniz, G.W. Leibniz. Truth is defined based on Necessary and Possible, which is done by Possible Worlds. A statement is Necessary if it is true in every possible world. A statement is Possible if it is true in some possible world. There are some axioms in Modal Logic, and one of them is what I shall call NP: Whatever is necessarily so is actually so. It is necessarily so implies it is actually so. If it is necessarily so then it is actually so. NA, in conjunction with some other axioms of modal logic and some rules of inference, is a theorem derived in modal logic. This theorem I shall call AP: Whatever is actually so is possibly so. It is actually so implies that it is possibly so. If it is actually so then it is possibly so. One inference of Modal Logic is what I shall call GR: Whatever is provably so is necessarily so. It is provably so implies it is necessarily so. If it is provably so then it is necessarily so. One comment is required of GR. Pythagorean Theorem is provably so, and in fact has been proved to be so, so it is necessarily so. It was proved based on a formal system known as Euclidean Geometry, which has its own definitions, axioms, and rules of inference. From these we are able to prove some statements. These proved statements show that it’s negation is not possible, and so the processes of elimination leads to that proved statement necessarily being so. (GR) Whatever is provably so is necessarily so; (NP)Whatever is necessarily so is actually so; Thus Whatever is provably so is actually so. This in turn means that AP is actually so since it was proved like the Pythagorean Theorem was proved. Since AP being provably so implies AP is necessarily so. And since AP is necessarily so, AP is actually so. Max Tegmarks hypothesis is the converse of AP. We may call this MH: Whatever is possibly so is actually so. It is possibly so implies it is actually so. If it is possibly so then it is actually so. We may thus assume MH is true and assume that AP is true. Since both of these are assumed true, they form a logical equivalence. We may call this *MH*: Whatever is actually so is possibly so if and only if Whatever is possibly so is actually so. If it is actually so implies it is possibly so then it is possibly so implies it is actually so. Max Tegmark presents his hypothesis, similar to how Albert Einstein presented Special Relativity, by his hypothesis being based on two assumptions. One of these assumptions, as already previously stated is MH. The second hypothesis of Max Tegmark is what we may call EW: There exists an external physical reality and it is independent of human observers. EW: There exists an external physical reality and it is independent of human observers. MH: Whatever is possibly so is actually so. EW is an existential statement and MH is a universal statement. This is very important to keep in mind, as shall be shown later on. Mr. Tegmark prefers to talk about MH being something like this, “Our external physical reality is a mathematical structure”. A mathematical structure, or mathematical existence, is “merely freedom from contradiction.” I use MH as I do because the definition of mathematical existence is the same as possible. For something to be possible it must not contain a contradiction. For something to be impossible it must contain a contradiction. Euclid’s geometry, for example, is a mathematical structure, and also has a mathematical existence. This means that Euclid’s geometry is “free from contradiction”. One cannot derive a contradiction within Euclid’s geometry. We may say that there are two categories. There is what is possible and there is what is impossible. What is possible contains two sub-categories. These are Necessary and Contingent. Something is necessary because it not being actual is impossible. Something is contingent because it not being actual is possible and it being actual is possible. For example, it is necessary that all bachelors are unmarried males and it is contingent that all like charges repel. Mathematics and Logic, at least, deal with what is Necessary. Metaphysics and Science deal with what is Contingent. The Criterion of Demarcation, or Line of Demarcation, between Metaphysics and Science, or Metaphysical Arguments and Empirical Arguments, is Falsifiability. Falsifiability was first laid out by Karl Popper in his book The Logic of Scientific Discovery, and throughout his other writings. There is one thing that all hypothesis must conform to, which is that of consistency, i.e. don’t allow contradictions. Necessary statements obviously conform to this, and Contingent statements are also suppose to follow consistency. Karl Popper points out, basically, that both metaphysics and science must adhere to consistency. One of the ways to refute a hypothesis is to show that it leads to a contradiction, which is known as a Reductio Ad Absurdum. You assume the opposite of a statement, and from this assumption you deduce a contradiction from the assumption. This proves the statement derived to be necessarily true, since its negation is impossible. One tests of Scientific hypothesis is to make sure it is consistent with all other scientific hypothesis (generally, unless a new hypothesis that alters the edifice of science like Galileo and Einstein did). Another test is to show that the hypothesis is internally consistent. Max Tegmark’s hypothesis, which contains both EW and MH are contradictory to one another. This is because MH allows for, what I shall call IW: There exists world and it is not independent of human observers. IW does not state how many human observers there are. There could be only one human observer, which is solipsism, or there can be infinitely many human observers, i.e. Human observer + 1 or N+1. MH allows for these possibilities, since there is no contradiction in such a situation. This implies that there exists a possible world where I am the only human observer, and it also implies that you,the reader, exists in a possible world where you are the only human observer. This also implies there exists a possible world in which only you the reader and I are the only inhabitants of a possible world where we are only human observers, and etc and etc. Instead of accepting MH itself, which means both accepting EW and IW, Max Tegmark accepts only a part of MH by accepting only EW and denying IW. MH is both being affirmed and denied since denying a part of MH and accepting a part of MH. This would also follow by a simple example of Modus Tollens. (1) All logically possible worlds exist implies there exists an external physical reality and it is independent of human observers and there exists a world and it is not independent of human observers. The general point is that it is logically possible that there exists a world and it is dependent on human observers. But it is also possible that there exists a world and it is not dependent on human observers. Both of these are contained in MH, and Tegmark denies one but accepts the other, while also accepting MH. This would be similar to holding to the Theory of Special Relativity (which would be MH here) as a whole and accepting the first postulate (which would be EW here) and denying the second postulate (which would be IW). This is impossible since the Theory of Special Relativity is defined by both postulates together. It has already been shown that Tegmark’s hypothesis already violates (a). But Tegmark’s hypothesis also violates (b). This means that the two axioms of Tegmark’s hypothesis (MH & EW) are not independent of each other. We may deduce EW from MH, which means that EW is not independent of MH. It would be charitable to believe that Tegmark doesn’t hold that EW is not possible, which means that Tegmark doesn’t believe that EW is impossible. But MH deals with everything that is possible. And so EW would be possible and thus be part of MH. These two “proofs” don’t assume that Max Tegmark’s hypothesis aren’t an empirical hypothesis, but they are consistent with Max Tegmark’s hypothesis not being an empirical hypothesis, i.e. consistent with Max Tegmark’s hypothesis being a metaphysical hypothesis. These are also theoretical proofs, not practical or “empirical proofs” themselves. There are two steps at falsifiability. One of them is that we show that the theoretical structure of the hypothesis is not itself contradictory. If the theoretical structure is not found to be contradictory, then we try to show that the theoretical structure is contradictory with empirical observations. If the theoretical structure is contradictory with the empirical observations, then the theoretical structure is falsified. First we try to show that the theoretical structure is contradictory or we try to show that the theoretical structure is contradicted by the empirical observations. The paper “A Logical Analysis of Some Value Concepts” was written by the logican Frederic B. Fitch, and appeared in the peer-review journal called The Journal of Symbolic Logic, Vol. 28, No. 2 (Jun., 1963), pp. 135-142.In this paper, a formal system was created for dealing with some “Value Concepts” like “Truth”, “Provability”, “Knowledge”, “Capability”, and “Doing”, to name a few. This deals with an abstract relationship, one as usually described by formally consistent systems like S-5 Modal logic. What Frederic Fitch presents in the paper is what Tegmark would call a “Mathematical Structure”. This “Mathematical Structure” also has some Theorems that are proved within it. Like AP was a Theorem in a “Mathematical Structure” known as S-5 Modal Logic and the Pythagorean Theorem is a “Mathematical Structure” in Euclidean Geometry, so too are there two specific Theorems that are counter-intuitive, and can both respectively be called the “Knowability Paradox” and “Provability Paradox”. These are, respectively, Theorem 5 and Theorem 6 in Fitch’s paper. Being Theorems, by the rule of inference GR, they are proved to be the case then they are necessarily the case. Whatever is provably so is necessarily so. By MP, whatever is necessarily so is actually so. So Theorem 5 and Theorem 6 are actually so, which is also consistent with the hypothesis of Tegmark with MH, i.e. whatever is possibly so is actually so. Which in turn means that Tegmark would have to accept that Theorem 5 and Theorem 6 are true if they accept that their hypothesis MH is true. Some equivalent ways of stating Theorem 5 is such as: It is necessary that it isn’t known that both “P is true” & it isn’t known that “P is true”. It isn’t possible that it is known that both “P is true” & it isn’t known that “P is true”. The existence of a truth in fact unknown implies the existences of a truth that necessarily cannot be known. There exists such a true statement that both statement is true & for every agent no agent knows that statement is true implies there exists a true statement that both statement is true and for every agent it isn’t possible agent knows that statement is true. Some equivalent ways of stating Theorem 6 is such as: It is necessary that it isn’t provable that both “P is true” & it isn’t provable that “P is true”. It isn’t possible that it is provable that both “P is true” & it isn’t provable that “P is true”. The existence of truth in fact unproven implies the existence of a truth that necessarily cannot be proven.There exists such a true statement that both statement is true & for every agent no agent proves that statement is true implies there exists a true statement that both statement is true and for every agent it isn’t possible agent proves that statement is true. These two Theorems show that it is necessary that agents, like human observers, know everything that can be known by those agents and proved everything that can be proven by those agents. This implies that Goldbach’s Conjecture, which hasn’t been proven to be true by human observers or proven false, cannot possibly be proven true or proven false. It will forever remain unprovable to human observers. It also implies that MH, or cannot possibly be known and will forever remain unknown. This would also hold for all agents, which are not omniscient agents. These is necessarily so and means it is actually so, especially by MH and GR. This is interesting because MH is presented as a hypothesis that is possibly true and it is not known that it is true or false. But since it is not known to be true and it is not known to be false, it cannot known to be true or false. MH, in conjunction with GR and Fitch’s Theorems, tells us that it cannot be known to be true or false and that it also isn’t provable that it is true or false, i.e. unprovable that it is true or false. The Knowability Paradox and Provability Paradox also attack one of the aspects of Tegmark’s hypothesis, which is that of EW. EW implies that other agents that are not human observers, which can be supercomputers or aliens, would also fall for these paradoxes as well. This shows that we can never have a complete description of the world, but can only have a partial description of the world. This means that human observers, supercomputer observers, or alien observers, all cannot have a complete description of the world. We, the agents of EW, will never have a complete description. What is interesting is that both paradoxes are very closely aligned with IW, or lead one to accept IW as true. Sometimes pointed out that the Knowability Paradox leads to Naive Idealism, which is part of IW and is thus not part of EW. This, in some sense would appear to imply that MH again implies another contradiction. Must a Mathematical Structure be Free from Contradiction? Does mathematical existence really have to be freedom from contradiction? It is possible to develop formal systems that allow for both violations of non-contradiction and violations of excluded middle. A formal system of such a sort was developed by Polish logical Jan Lukasiewicz. This logic was created by using three values for logical matrices than two values. Lukasiewicz three value logic has been axiomatized, so that there axioms, definitions, and logical relationships between propositions. And from this three value logic one may obtain violations of non-contradiction and violations of excluded middle. If there is a violation of non-contradiction then there is a violation of mathematical existence. As Tegmark points out, A formal system consists of (1) a collection of symbols (like “~”, “–>”, and “X”) which can be strung together into strings (like “~~X–>X” and “XXXXX”), (2) A set of rules for determining which such strings are well-formed formulas, (3) A set of rules for determining which Well-Formed Fomrulas are Theorems. Lukasiewicz three value logic satisfy all three of these criterion for a formal system. From this it becomes obvious that formal systems do not need to be free from contradictions. This formal system allows for both (P & ~P) to have a truth value of neither True nor False. This is because, as the Conjunction Truth table shows, P= 1/2 or Indeterminate and ~P= 1/2 or Indeterminate is a well formed formula that is itself Indeterminate. Does this mean that mathematical structures must be free from contradiction? It appears that Lukasiewicz’s formal system, and there are some others that can be created, show that mathematical structures and thus mathematical existence, do not need to follow the being free from contradiction. Lukasiewicz’s formal system can be expanded to allow for infinite number of truth values. One important part of Tegmark’s idea of MH, which implies EW, is that it prohibits Randomness. He states that “the only way that randomness and probabilities can appear in physics (by MH) is via the presence of ensembles, as a way for observers to quantify their ignorance about which element(s) of the ensemble they are in.” Now Lukasiewicz’s logic can be the way our actual world is. This would mean that the world is random or indeterminate. Lukasiewicz’s even himself says that his three value logic is based on the position of indeterminacy, which is contradictory to determinacy. Here are some interesting things from Karl Popper on Falsification and Induction, or Hume on Induction. Now someone might wonder how we cannot give any positive reasons for establishing the universal theories, or justified them, or made them probable, by all the observations that confirm its predictions on tests. This comes from what Popper takes to be Hume’s problem of induction. I think it should be pointed out, Hume did bring up that the basic idea of induction was that “we suppose, but are never able to prove, that there must be a resemblance betwixt those objects, of which we have had experience, and those which lie beyond the reach of our discovery.” Induction is also done in other ways besides going from particular statements to universal statements. [I.] Move form particular statement to particular statement. In 1997 the Chicago Bulls beat the Utah Jazz in the NBA Finals. In 1998 the Chicago Bulls beat the Utah Jazz in the NBA Finals. Thus, the Chicago Bulls will win against the Utah Jazz the next time they play in the NBA Finals. [II.] Move from general statement to general statement. All NFL teams made tons of money this year. Thus, all NFL teams will make tons of money next year. [III.] Move from general statement to particular statement. All NFL teams made tons of money this year. Thus, the Ravens will make tons of money next year. [IV.] Move from particular statement to general statement. This crow is black. Thus, all crows are black. Each of these, though, follow what Hume points out for Induction. They are going from the known to the unknown, which does not have to include the future or past.Hume also says that the only thing that can take us from the known to the unknown is causality, or a necessary connection between two events to form a necessary causal relation. But Hume already pointed out that this relation is not found by experience. So Hume comes to the conclusion that since the necessary relation between cause and effect or continuation of that relationship, is not shown by experience nor demonstrative, or that the principle of induction is not known by experience or demonstrative, but that they are creations of the human imagination that cannot be shown to be true based on experience or reason, and any justification of them will either rely on an infinite regress or circular reasoning. So they cannot be proven to be true. This would mean that when science proposes either a causal connection, or what will happen in the future, or what happens beneath sensible qualities, cannot be proved by experience to be true , or by reason to be true, or even held to be probably true. IOW, we are not justified in proposing things beyond what is known, since they cannot be shown to be true or probably true. So scientific hypotheses are unjustified and cannot be shown to be true or probably true, or natural laws cannot be shown to be true or probably true or justified. Popper comes along and tries to save science, in some way. But you notice where his position eventually leads as well. 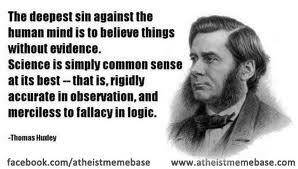 He admits with Hume that we cannot demonstrate the truth of a scientific hypothesis or explanation; we cannot show by experiment the truth of a scientific hypothesis or explanation; we cannot show that a scientific hypothesis or explanation is probably true. All we can do is show if they are false. We can give negative reasons to a scientific hypothesis or explanation by it failing its severe experimental/observational tests. This is because it follows the demonstrative inference of modus tollens and disjunctive syllogism, so we can demonstrate that a scientific hypothesis or explanation is false. So falsifiability, or refutabilty, can show you only that a scientific hypothesis or explanation is false. Refutability cannot demonstrate that the hypothesis or explanation is true, or has been shown by experience to be true, or is probably true. It can only tell you that it may be true, and it has not failed any of its tests so far. It doesn’t even appears to care if something is true, only that it can be shown to be false. And here are Hume on what Induction is, or relies on.